The change comes after discussions with the Associate Student Goverment and student focus groups, according to Northwestern athletics spokesman Paul Kennedy in The Daily. The students wanted better views of the field, an unobstructed line of sight to the 'CatVision score board videos, and more opportunities to appear on television broadcasts. "We can't move the video board and we can't move the TV [cameras], unfortunately, so we moved the student section and the band," Kennedy said in the report. Now broadcast cameras situated on the west side of the arena will have a better view of the Wildcat Band and purple-clad Northwestern students in the stands. 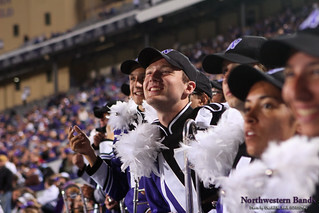 Aside from the direct benefits to the fans and the Wildcat Band, the new seating arrangement will also improve Ryan Field's television coverage. "Yeah, I'm pretty pumped about Northwestern Wildside moving to sections 111-114 next year," Bowsher wrote. 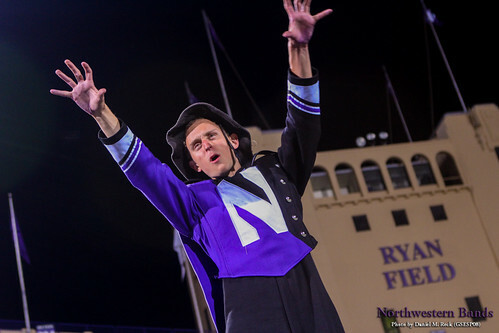 The Daily's Putterman reports another change: The Northwestern football team may also swap sidelines. According to The Daily, "In the past, NU has stuck to one side for an entire season — west, in recent years — but beginning in 2014, the team will make that decision week-to-week, depending on the weather and other factors, Kennedy said." The Wildcat Football home season begins on Aug. 30 when they host California. Until then, fans may find Wildcat Football on Facebook and on Twitter as @NUFBfamily, they also find Head Coach Fitzgerald on Facebook and Twitter, Be sure to also follow Twitter hashtag #B1GCats for the latest Wildcat athletics action. Photos by Daniel M. Reck.